I’ll admit, I never set out to own my own bath and body business. After receiving Cs in both high school and college chemistry, I never dreamed my entire life would revolve around chemical reactions and processes. When I was in junior high school, I wanted to be either a lawyer (I’m very logical and love to argue, er, debate) or an architect (math isn’t my best subject), and certain aptitude tests determined I’d do well with either profession. Then in high school, I encountered the likes of Carl Jung, Abraham Maslow and B.F. Skinner, and a future Psychology major was born. Long story short, I went on and got my B.S. in Psychology, followed by an M.A. in Counseling, and while I was trying to back-door my way into my counseling training, God called me to be a chaplain. I went from someone who’d studiously avoided crisis counseling and crisis work to doing it all the time and loving every second of it! I worked with families of all ages, nationalities, backgrounds and faiths. I calmed the anxious, said prayers for successful surgeries and comforted the grieving. Every “identified patient,” which could include actual patients, family members or hospital staff members, was precious to me as a created child of God. I trekked fifteen minutes across the hospital at 5:00 in the morning for a death call. I answered many summons to the Emergency Department at 3:40 in the morning when a gunshot victim came in. There were papers upon papers to write, encounters on which to reflect and at one point, the supervisor from… well, you know where. This week, I was grateful for every single moment of that experience, because those experiences helped me navigate a major crisis in our family. My cat died Monday. She was almost 17 years old and she’d been in my heart since she was three days old. She lived a long, well-loved, very pampered life. It’s been hard. My little girls are having their own hard times dealing with it. In the midst of this, God has been there. One question we had to answer in our weekly reflections was, “Who was God for you this week?” This week, my friend Bobby was God to me as he listened to me talk and cry and blubber for hours a day. Through him, the Spirit was able to work in me, lending me her strength and enabling me to be present to my husband and girls. Our neighbor Shayna was God for my older daughter. Shayna had worked last Summer at our vet’s office and had helped care for Octavia there; she’d also cat-sat for us over Christmas. Shayna provided Mary with a space for her own grief without her having to share the “grief space” with anyone else. Business came to a screeching halt while we said our good-byes, mourned and began the healing process. But life does go on for the living, both four-legged and two-legged, and we’re back to business as usual. As you go through the next week, I encourage you to keep your eyes open to who may be God (as you understand God to be) for you. You might have noticed that the look of my blog has changed. It hasn’t escaped your notice, I’m sure, that the banner isn’t quite centered. We’re aware of that problem and are taking steps to fix it. Please bear with us, and in the meantime, enjoy the articles here. Thanks so much for your patience! Safe, All Natural, Skin Safe AND Chemical-free? Not Happenin’! When you say that the product is one hundred percent natural, does that mean that it has no dye, chemicals or harmful ingredients and is safe for your skin? As far as skin-safe… All of my products are skin-safe. Not all of them are 100% natural, but I’ll identify those which are and are not so it’s hopefully clear to my customers. My goal is to go all natural whenever possible and as gentle as possible. I strive to make products that suit all skin types and preferences. We here use my products on a regular basis, including my two children, so whatever I make must suit their skin first. One hundred percent natural can have colorants, but I don’t use dyes in these soaps. Sometimes I don’t use any colorants at all, though the essential oils may impart a tint to the finished soap. If you consider an ingredient harmful if, in its raw form, it can cause harm, then, yes, my soaps contain a harmful ingredient. One of the three main components in soap is sodium hydroxide (lye), which is a very strong caustic agent and extremely harmful in raw form. However, it is what reacts to the oils in soapmaking, working with the oils to create soap. I formulate my soaps to have leftover fats (the term is “superfatting” or “lye reduction”). This means that I alter the oil/lye ratio so that the lye cannot possibly saponify (make into soap) all the oils. This makes soap more moisturizing. I also like using milks in some of my soaps, especially goat milk and coconut milk, which also makes the finished soap more skin nourishing. 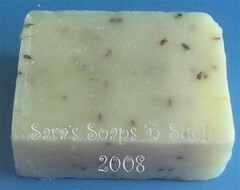 Finished soap contains saponified oils with no active lye. The dictionary defines “chemical” as “a substance obtained by a chemical process or producing a chemical effect.” Going by that definition, all my ingredients and products are chemicals. Lye dissolves in water, then the lye mixture reacts with the oils in all sorts of cool ways. The raw soap changes color, opacity and viscosity. Then as the saponification really gets underway, the raw soap gets very hot through an exothermic (literally, heat sending) reaction. The end result is soap and glycerin. Essential oils are often the result of chemical processes. Soapmaking and cosmetic manufacturing is pretty much all about chemical reactions. In some products, I use manmade chemicals, such as preservatives (vital in water-based cosmetics) and fragrance oils, which are a blend of essential oils and synthetic components. Occasionally, I’ll use other manmade ingredients in certain products, but not without a specific purpose. If there is a natural alternative or if the ingredient in question won’t add anything significant to the end product, then I’d just as soon leave it out. Got a question? Feel free to shoot me an email or post it in the comments. Posted on February 5, 2013 Categories Vintage Sara's Soaps 'n SuchLeave a comment on Safe, All Natural, Skin Safe AND Chemical-free? Not Happenin’! My friend Diane renames certain days of the week “Makinday.” These are the days when she’s slamming the soap production and filling her soap curing racks with her creations. This past Saturday, I’d planned a Makinday, and one of my friends wanted to watch the process. I’d already started by the time Bobby showed up (I’d been itching to get started), but he was able to see one of the soaps from start to finish. What was so exciting about this? I absolutely LoVe teaching people how to make soap, and I really get a charge out of sharing my passion with others. The fact that this was a friend just made it all that much better. We started with a rebatch of wine soap. Bobby and my younger daughter shredded the soap into the bowl while I gathered everything for the second batch. After pouring some water over the soap shreds and covering the bowl, we moved on to the next soap. Soap #2 was Lemon Grove Gardeners Soap. This was a cold process batch and is very straight-forward. It’s a scrumptious blend of skin-lovin’ base oils, an exclusive essential oil blend, corn meal and calendula petals. It wasn’t long before that soap was tucked into bed, covered and insulated. Bobby helped with Soap #3. He measured and melted some of the oils and ran the stick blender for the very few minutes before the soap came to a heavy trace. 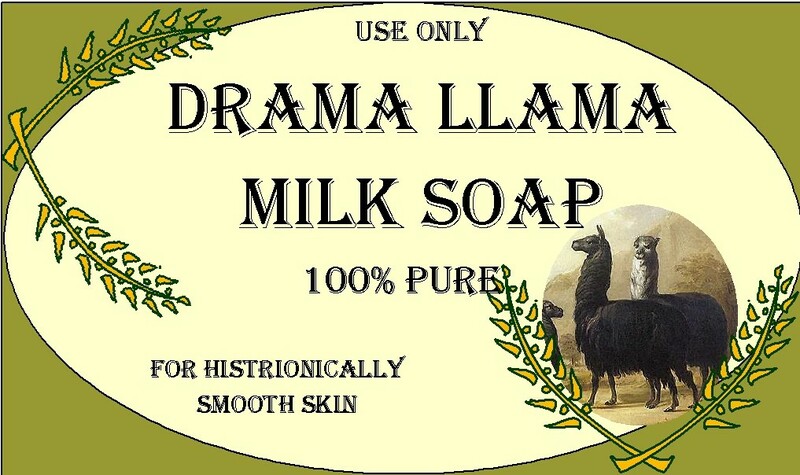 This batch was Drama Llama, a fun soap with subtle sparkles and a frosted appearance. Unfortunately, this batch took much longer than anticipated to neutralize, and Bobby had to head home before it was finished. Before dinner time, Drama Llama was in the mould and filling our lower level with the scent of amber, vanilla and musk. After dinner, I was able to get back to Soap #1, that wine soap rebatch. It got nicely melty and it was time to scent and color it. For this soap, I brought back a Sara’s Soaps ‘n Such exclusive fragrance, Pacific Sunset. Pacific Sunset is an enticing, intriguing blend of jasmine and eucalyptus. I mixed up my colorants and added them to my soap. The bronze, green and yellow swirls were beautiful, exactly what I’d wanted. And then I saw the fragrance still sitting on the counter. Uh oh! The swirls didn’t come out quite as beautiful once I slowly, carefully folded the fragrance into the soap. But this soap will mellow out to pure loveliness with its antioxidant-rich wine and zippy scent. Lemon Grove will be available in about three weeks, and Drama Llama and Pacific Sunset should be ready in a week-and-a-half. Be sure to follow my Facebook page to find out exactly when these jewels will be available. Of these three soaps, which one sounds the best to you, and why?